Every child needs toys, and every child I have ever known does not shy away from leaving those same toys on the floor of their room. What if putting away the toys was just as fun as playing with them? The Caboose Toy Box retains all the great qualities of a reliable toy box, but has the appeal of a brand new toy itself! I reached Skiltools through www.woodworkersworkshop.com, and was met with so many wonderful project ideas, one of which was this toy box. Not only does it provide ample space for larger toys, it also maintains the characteristically elevated upper part of a caboose, in this case utilized for small item storage. 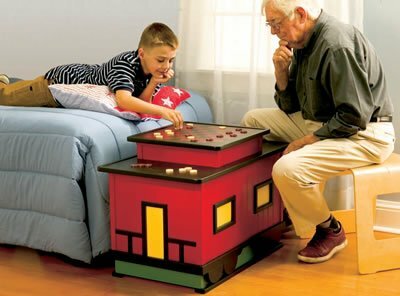 The icing on the cake (or the roof on the caboose, as it were) is the checkers board on the lid. Just one more wonderful element to this already stunning and practical piece. According to the plans, painting the caboose chest tends to be the most time consuming part of the process. Conversely, there is a comprehensive diagram outlining all the steps in the process, as well as a specific and detailed materials list to make your finished product that much more attainable. Mostly made of birch, this toy box will be a wonderful addition to any child’s room, for both the parents and the child. Can I get a copy of Jason’s train mentioned above? Your “Open PDF” link seems to want to load some software. Can I just download a simple PDF file? greetings all. I took a look at this plan and used it as a reference for My own. I made it larger and more proportionate to what I think is an “ideal” caboose. afterwards I thought. “whats a caboose without the train?” so I drew one up with the same general stylings of the caboose. I will gladly provide what I have to anyone in a format they can read. I drew the designs in autocad, to scale and have not dimensioned or made a cut list. but in time I will. That is terrific. Can you provide pictures of your project? You should be able to upload using the contact form. If you would like to provide a copy of the file in this post, please send a copy to [email protected] and we’ll include the upload. It might also make sense to convert your autocad file to Sketchup since it is a free program. You can send pictures via e-mail if you would like.